Zone Team selection dates for 14/Under athletes is 9/01/07 to 3/02/08 and for 15-18 athletes is 9/01/07 to 3/09/08. Application must be received by the Zone Team Coordinator for 14/U athletes no later than 3/2/08 and for 15-18 athletes no later than 3/9/08. NO LATE APPLICATIONS WILL BE ACCEPTED. All times for consideration are based on the period 9/01/07 up to and including the cutoff date for your age group. For an explanation of times eligible for consideration, see 14 & Under Athletes and/or 15-18 Athletes. Applicants selected for the team will be notified immediately following the applicable cutoff date. Best top 20 times are by age-group and event and are currently based on times for the period 09/01/07-3/9/2008 . This list will continue to be updated periodically until the team selection process is completed. See here for a list of meets that are included. Ages are as of April 3, 2008; the first day of the Eastern Zone Spring SC meet. Athletes are ineligible for consideration if they have participated in a USA Swimming National Championship meet or USA Junior Championship meet and are excluded from these lists. Additionally, except for 12/U athletes, swimmers who have a qualifying time for the USA-S SCY Championship, 2008 Speedo Junior Championship meet or the 2008 ConocoPhillips National Championships or Olympic Trials may not participate at the Zone meet. Accordingly, a swimmer having any of these times is NOT included in these Top 20 lists for 13-14 and 15-18 year old swimmers for any event. All times received to date appear in "Top 20 Preliminary Best Times" reports. All subsequent PVS meets will be automatically loaded, including initial relay leg swims, if properly loaded in the data base provided to PVS. Teams participating in meets in other LSC's should promptly submit an electronic file of the meet results to the PVS Database Coordinator for inclusion in subsequent updates. Zone Team Applications received through 3/9/2008 at 10:10PM (for 15 & Over Swimmers) are now posted. If you feel your application is missing, please email PVS Zone Coordinator (click on the link). No more 14&Under Applications are being accepted. No more 15-18 Applications are being accepted. Times from all High School Approved meets (that have been loaded into the USA Swimming Data Base Swims) through 2/24/2008 (see all meets in data base for a list) that were recognized by USA Swimming Swims are now included. These times will show the swimmer as unattached (which they are for High School Meets). 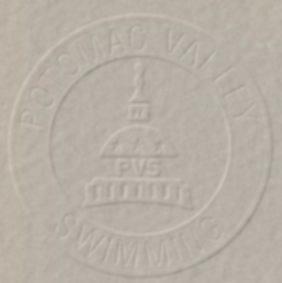 Times from MCPS Counties & Metros do not have lead off relay swims, if a time is needed you will need to request it by email to PVS Database Coordinator. Missing out of LSC Meet added on 3/3/2008 (CBAC Winter Wake-up Meet). All 14/Under Athletes are requested to notify the Zone Coordinator of their intention to scratch no later than Sunday, March 9th, 5:00 PM. All 15/Over Athletes are requested to notify the Zone Coordinator of their intention to scratch no later than Tuesday, March 11th, 5:00 PM. Scratches are final upon e-mail confirmation of receipt by the Zone Coordinator.